I stayed 4 nights in the female shared dorm at this hostel and it was fantastic. 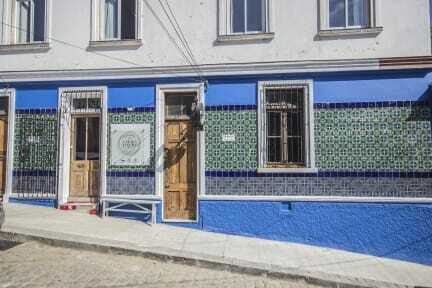 The hostel is very quiet and easy to rest and relax in always kept tidy, clean It is close to many great restaurants, shopping and fun in the neighborhood and is very easy to navigate to main squares for public transportation. The breakfast is simple and very good - served in a sweet neighboring restaurant and the wifi was very reliable for my work. Love this hostel! Has more of a B&B feel to it. Awesome location, great wifi and friendly staff. The breakfast was fairly simply but it was nice that it was served in the adjoining cafe. Good WiFi, good kitchen for self catering, overall a new place that comes across well - 2 critiques - both relating to the adjacent/adjoining restaurant - woken up both days by the sound of the kitchen coming to life at 7am - if you are in the downstairs dorm room you will hear every noise, every conversation, coming from that kitchen. 2nd critique - gluten free restaurant - some people will love it - as a gluten eater I found the bread disgusting in taste - how about offering gluten options?! In general quite dirty - both our room and bathroom facility.